As you may be able to tell from my previous blogs, music is just about the most important thing in my life. Of course, my family will always come first but unless my football team is doing exceptionally well (that never happens! ), music takes up every spare minute of my time. I suppose therefore that it was only natural that I would eventually find myself involved in the music industry in some way or another. But, the question was: in what way? I was never very musically gifted. I played the violin at school for a few years and managed to perfect the art of mimicking the sound of nails down a blackboard. However, as I got into rock music, the violin held less and less interest for me and eventually, I gave up. I turned my attention to the guitar and, for a while, persevered with it. I took lessons for a few months and then even bought a couple of guitars of my own; a Tanglewood electro-acoustic and a black Ibanez electric guitar. The problem was that I learned left-handed, so I was never able to find or afford the guitar I really wanted – a Jackson Kelly (you know, the cool, pointy one that Marty Friedman used in his Megadeth days). I would sit in my bedroom and practice diligently – just ask my neighbours who can no longer listen to the intro to ‘Sweet Child O’ Mine’ without grimacing! Unfortunately, I just didn’t have much in the way of natural ability and so, whilst I still dabble, I knew that I’d never be good enough to be in a successful band. So it was that, with some time on my hands having passed my exams and got the requisite qualifications for my career, I somehow fell into writing. I would call it music journalism, but I will let others be the judge of that. I discovered Powerplay Magazine whilst on a course in Glasgow and was immediately impressed with the content, specifically the reviews section. Every genre of rock and metal was covered within the most comprehensive reviews section I had ever seen in print. I loved the fact that I finally had a magazine that catered for all of my wide tastes within rock/metal, from prog to death metal and back again. Up to that point, I had read Terrorizer (and still do), but I wanted something to balance out the all-out extremity upon which this magazine rightly focused so well. Kerrang! was no longer an option and Metal Hammer was a bit hit-and-miss at that time. I soon decided to subscribe to Powerplay and it was a few months later that I saw an advert within it, asking for contributors. I felt strangely compelled to reply and so I fired off an email to the editor, Mark. I had never written for anything or anyone before but I was up for the challenge. At school, I seemed to do well in English, so maybe I wasn’t too bad at constructing a sentence. Also, throughout my teens and early 20s, I was always keen to share my love of music with others. My first instinct to hearing something good for the first time was to share my discovery. Sometimes, I’d call my brother or my friends or, as technology advanced, send a frantic text message. This then appeared to be the perfect way to share my love of music and my discoveries with a wider audience. I was delighted when I received an email back from the editor offering me a trial. I was immediately informed that I wouldn’t get paid for my work but I wasn’t bothered in the slightest – I was finally going to be involved in the music business. I received two albums to review and I sat at the computer for hours painstakingly trying to construct something both interesting and concise. I look back at those early efforts and I cringe slightly, but for a first attempt, I was quite pleased. The magazine naturally works about a month behind, so it was four long weeks before I received Issue 80 and was able to see my name in print for the first time. My fingers trembled in excitement as I thumbed through the magazine hunting for my contributions, but it was all worth it. I must admit that, even six years and nearly 70 editions later, I still get the buzz from seeing my name in print! 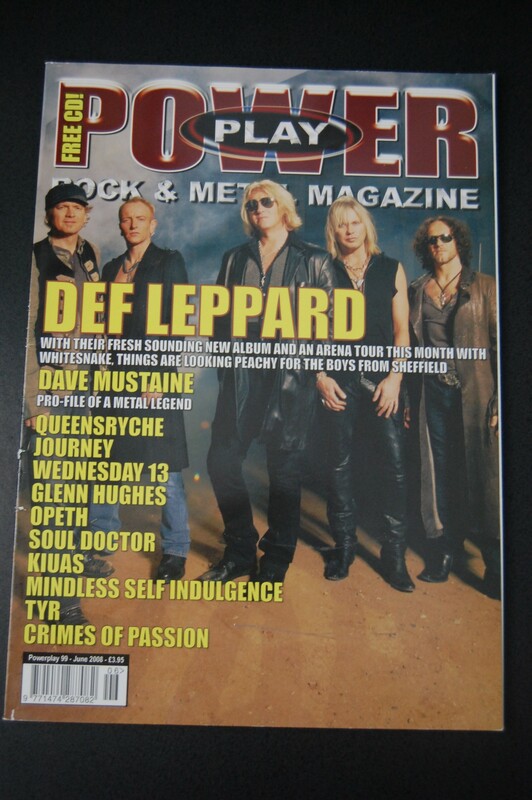 It was all a bit of a whirlwind from there as within a few short months, I began to conduct interviews with bands and was even given the honour of a front-cover article, in the shape of an interview with Def Leppard’s singer, Joe Elliot. My first front cover article! I have enjoyed the experience so much over the years that I have now started to write for other outlets too. For the last few months I have been contributing to the website ThisIsNotAScene (website) following a tip-off from a friend on Twitter (thanks Spike) and, through a connection at ThisIsNotAScene, I have even more recently started offering my services to Ghost Cult (website). Whilst I still harbour the wish to one day get paid for my writing, I currently do all this for the love of the music. What’s more, I will continue whether or not I eventually earn a few quid because I genuinely enjoy what I do. It gives me the opportunity to be involved in the scene in a privileged way and offers me the opportunity to give something back. After all, I have had the best part of 20 years’ entertainment from all these bands – it’s the least I can do!